A pearl bracelet is the perfect way to enhance your outfit, making it more elegant without overwhelming it. If you’re new to wearing pearls or if you’re looking for alternatives to the traditional, one-strand white pearl bracelet, this style guide comprising 6 unique ways to wear a pearl bracelet will show you all the tips and tricks you need to look unique, just like every single pearl. These precious gemstones can instantly elevate any outfit, so you can wear them both with casual chic attire and formal power suits. Here are our hand-picked suggestions that will change the way you’ve been looking at pearl bracelets forever. Whether you own a freshwater pink pearl bracelet or a classic white bracelet with large pearls, here are a few ideas for a more modern look. This can be considered a true work of art. The bold design meets the delicacy of pearls and, combined, the result is daring, yet unexpectedly stylish. Save this piece for a special night event and you’ll surely steal the limelight. Let this cascading pearl bracelet with dozens of small white gemstones be the statement piece of jewelry of the evening by keeping the rest of your accessories low key. Not sure what attire to choose to create the perfect ensemble? If the minimalist style appeals to you, aim for a striking contrast between your statement pearl bracelet and your clothes. To achieve this effect, opt for a black, structural gown or a backless jumpsuit with long trousers. You won’t fail to turn heads and everyone will look at your arm candy in admiration. 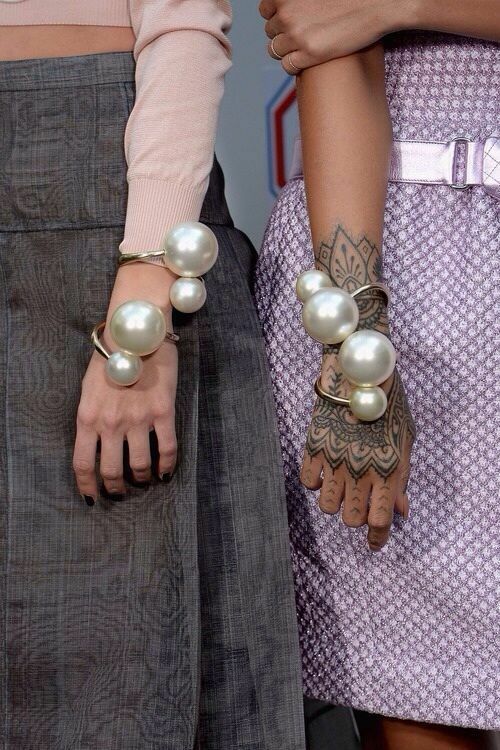 Pearl bracelets are no longer conservative or demure pieces of jewelry. They can be fun to wear, adding the flirty factor to your skater dress outfits. 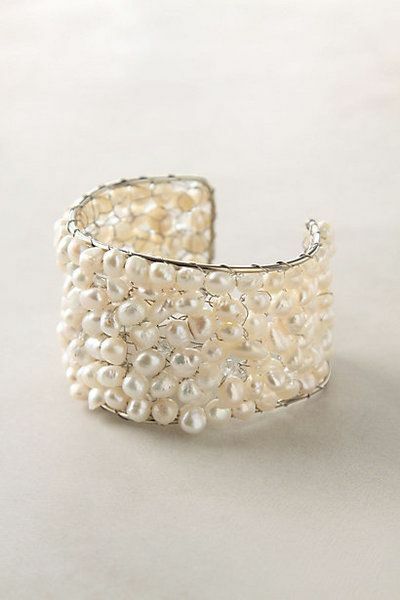 If you usually reach out for ballet flats and summery dresses, you’ll love this pearl bracelet suggestion. Fun, yet elegant, this pearl bracelet with charms makes the perfect graduation present for any young lady. It’s not difficult to look polished and put together even when you’re in a rush in the morning heading out for classes or for work. Pearls are timelessly beautiful and work wonders paired with a messy bun and a casual outfit. The best thing about this fresh take on the pearl bracelet is that it can be worn with other accessories that don’t necessarily comprise pearls. Add a pair of silver earrings or a dainty pendant and take on the world with your feminine charm. Pearl jewelry is not reserved only for your neckline, wrists, fingers or ear lobes. As many fashion designers have proven over time, pearl anklets can achieve an ethereal look, especially when they are worn on the beach (so close to the sea where they come from). Pearl anklets beautify a woman’s ankles and add a unique touch to a summery dress. Depending on your personal style and the look you’re going after, you can choose small, delicate pearls to adorn your feet, or large, baroque pearls fit for a queen’s ankles. Either way, the result is spectacular. Wearing a pearl anklet will make you look poised and sophisticated. The perfect accessory for a beach wedding or for a beach party, pearl bracelets can easily be transformed into anklets to make you feel one of a kind. If you’re a fan of velvet or ribbon, you won’t be able to resist this cute combination. If you’re not afraid to roll up your sleeves and try out a weekend DIY, we have the perfect project for you. 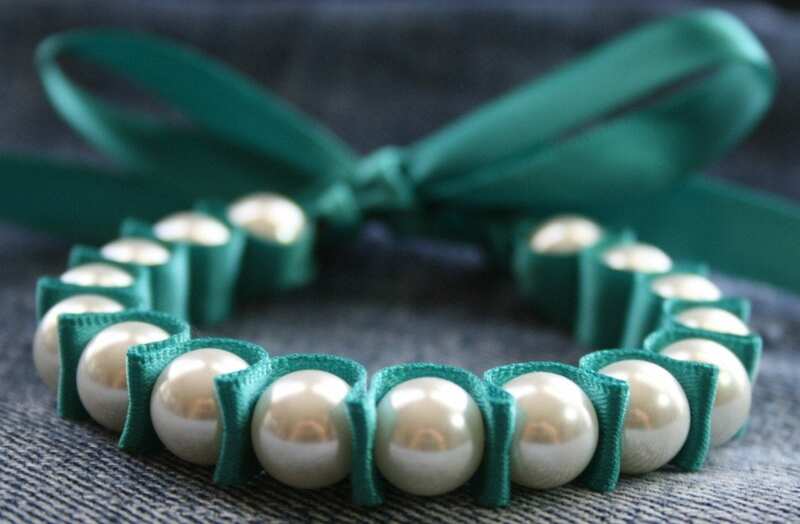 All you’ll need to make yourself this gorgeous arm candy is some loose Freshwater pearls in your favorite color and a matching velvet ribbon. Quick and easy to achieve, this customizable pearl bracelet is bound to become your wardrobe staple. If you want to incorporate pearls in your attire, but you don’t want to look too formal, this is the way to go. Investing in some high quality loose pearls means creating a sturdy piece of jewelry that will beautifully suit any outfit. What is more, if you ever get tired of your pearl bracelet, you can remake it using a different type of ribbon or transform it into earrings or a necklace. An edgy look wouldn’t be complete without the right accessories. That includes statement bracelets. Even though pearls are seen as feminine and delicate, it’s not impossible to wear them as edgy statement pieces, especially when they are set in a thick cuff. This jewelry item will accentuate your wrist and tame down the rock side of your outfit. Pearls are not only breathtakingly beautiful, they’re also highly versatile. They can be adapted to any style and will do justice to any complexion. 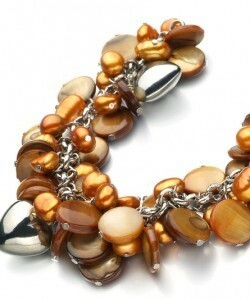 Don’t shy away from sporting this type of pearl bracelet with other chunky jewelry. The contrast between the mysterious pearls and harsh metals makes for a fresh approach. After all, this is the embodiment of fashion: having fun and constantly experiment with new looks, accessories and styles. Not for the faint of heart, this oversized pearl bracelet is a veritable show-stopper. It goes without saying, this is the perfect example of a statement jewelry item, so it’s a good idea to keep the rest of your accessories to a minimum. Tue oversized pearl bracelet was seen at various designers throughout the last couple of years, proving that there are still a plethora of ways to reinvent pearls and wear them in a modern and sophisticated manner. From what we can see on the catwalk, this type of oversized multiple pearls bracelet is a great companion to soft grays, romantic lavenders and blush pinks. The neutral pallet provides a beautiful canvas for the pearls to shine their beauty, however, they would look equally striking against a little black dress or a fiery red top. This entry was posted in PearlsOnly Blog and tagged freshwater pearl bracelet, white pearl bracelet by PearlsOnly Team. Bookmark the permalink.